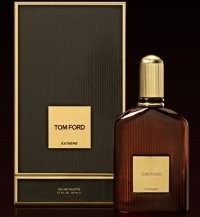 An intense yet gentlemanly interpretation of sensuality, TOM FORD EXTREME exudes impeccable style and fearless confidence. Through the intricate craft of luxe perfumery, this masterful scent boldly explores an uncharted path by blending ultra pure Persian Lemon, lush Black Italian Fig, decadent Black Truffle, vintage Patchouli and rich Cedarwood in a uniquely modern way. The textured and complex heart is structured from Black Plum, Parma Violet, Cedar Wood Atlas and Sandalwood, enlivened with a pinch of Saffron and Thyme, then wrapped around the aromatic note of Italian Brogiotto Black Fig. Pure essences of Rum, Haitian Vetiver, Caramel, Vanilla, Black Truffle and Fir Balsam are blended with a supple Leather Accord and Amber. Rich and velvety Patchouli Vieux, a vintage essential oil and precious Shoyeido Incense, considered the finest incense in the world, add lasting layers of sensuality. Though I say masculine some people do say it's more unisex. A versitile fragrance that flexible enough for anytime and any place. Very good projection and great longevity but oh that price tag. Probably a little too heavy in reality but overall a great fragrance and a terrible price.